From premenstrual syndrome to pregnancy, women deal with many issues in life that are unique to their gender. Those life changes and other factors can lead women of all backgrounds and situations to experience mental health or addiction issues, and busy modern schedules don’t help. “I think what is sometimes difficult for people is to actually take time to look at what is going on in their lives,” says Janus Moncur, LCSW and Certified Clinical Trauma Professional at FHE Health. Among other things, Moncur works with the Women’s Empowerment program at FHE Health. “One of the neatest things about it is to realize sometimes women become so isolated in their lives, they are afraid to reach out,” says Moncur. She says the program likes to talk about women helping women and that, in a group environment, women are able to speak about things they may not feel comfortable talking about in mixed company. She says they aren’t judged and are able to talk to people who understand what they’re going through. To help women understand some of the common events that can lead to mental health and substance abuse issues, Moncor provides some insight on five major areas of life and the changes to them that impact women’s mental health. A major holiday scores 12 while change in working hours or conditions scores 20. These are both considered stressful events. But marriage scores 50, divorce 73 and the death of a spouse tops the list, scoring 100. Moncur says any event that changes your relationship with a significant other, adding or removing them from your life, can impact mental health. That could include business travel, imprisonment or injury. And if you come together again after a long time, that change is stressful too. All the same types of occurrences that cause stress with a spouse can cause you stress if they relate to other family members. Women may feel especially stressed when separated from children, for example. Moncur also notes that changes in family dynamic can be stressful, such as taking care of an older parent. 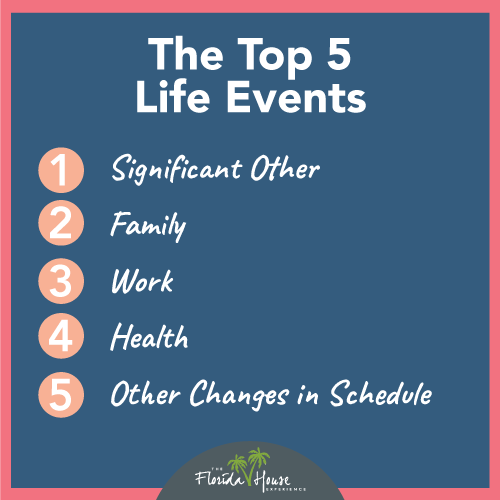 Other major family events can include losing a child or taking care of a chronically ill child. According to Moncur, the leading cause of stress at work is simply being unhappy. And that can happen for a variety of reasons. With many women choosing careers over families or children, Moncur says problems with a career can be that much more impactful to mental health. Job stability is also a factor in work-related stress. “Nowadays, we’re seeing a lot of cutbacks and reorganizations,” says Moncur, “and anything that changes your job can be stressful.” Whether you lose your job or have to take on a heavier load because others have, your mental health can be impacted. A new stressor that Moncur says Holmes and Rahe didn’t have to consider is danger in the workplace. “Typical jobs that were not considered dangerous in the past, such as working in the post office or being a barista at Starbucks, can be more dangerous due to the climate we have in the world now,” says Moncur. In short, simply having a job can be stressful and impact your mental health. Pregnancy, miscarriages and even a pregnancy scare can bring huge changes — and the accompanying stress — into women’s lives. Moncur also points out that today, women have to ability to undergo tests to know if they have genetic markers for certain diseases. Learning something like this at an early age can be stressful enough, but then learning that you have the beginnings of the disease can be even more challenging. Moncur says that any change can be stressful, especially with the pace of modern lives. Changes in work conditions, hours, where you live, sleeping habits, eating habits or whether you can take vacation or not are just some of the things that can impact mental health. Often, people don’t realize the impact these types of changes may have. All of these changes and the life stress that comes with them are not unique to individual women. Women all over the country — even the globe — face these issues, and each person deals with them in a different way. When the impact to mental health becomes overwhelming, though, individuals may begin to suffer from issues such as anxiety and depression. They may also begin abusing drugs or alcohol. In either case, FHE Health can help. Moncur talks specifically about two ways the programs can help. First, she points to neuro-rehabilitation. “The specialists can map your brain and see different areas and how they have been impacted by trauma or stress,” she says. The mapping is so accurate, it can even tell a story about symptoms, such as if someone has been sleeping well. Once the issues are mapped, Moncur says there are protocols to help heal these areas of the brain. In short, women can work with specialists to retrain specific areas of their brain to react in new, healthier ways to situations, stressors or even addiction triggers. Moncur also highlights FHE Health’s comprehensive approach to women’s mental health. “We’re not just about substance abuse,” she says. “We’ve found that if two different people experience the same type of trauma, they may react in different ways. One may be resilient while the other is crushed.” She said part of the purpose of FHE Health is to teach individuals to have that resilience by developing protection factors such as strong coping skills and a support network. Ultimately, women should know that they are never alone in their struggles and they can always reach out for help. At FHE Health, they’ll find compassion, like-minded individuals and help to face whatever mental illness or substance abuse issues have begun to impact their lives.